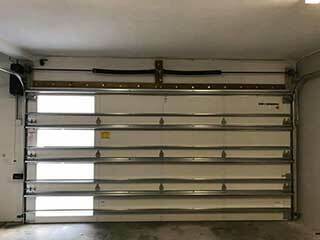 Extension and torsion springs are the main two types of garage door springs that are used today. There are plenty of differences between them, mainly in the way they work. With these components being the parts which actually move the door, adjustment and installation play a vital role in the proper operation of the system. Our experienced repair professionals can help you take care of these components and provide you with any required service. Although average doors would usually carry only one torsion spring or a pair of extension ones, larger and heavier doors many need more of either. During their lifespan, garage door springs have one job to do. This is to counterbalance the door so that it will open evenly and easily. Each type works in a different way. Connected with cables and pulleys, the two extension springs are installed on each side of the door and contract and extend in order to lift and lower the door. The torsion spring is installed above the door itself and winds and unwinds in order to move it. It is stretched across a metal shaft and transfers its power to the cables. When any of these components are damaged, the door won't be able to open or remain open. In such cases, trying to use the opener, or even move your door manually, can be incredibly dangerous. The door could collapse if there is another spring installed it may break as well, which could cause it to go flying around your garage and hurt somebody. Apart from replacing springs, we also replace damaged bearings, brackets, cones, pulleys, and cables. There is a great way to avoid a lot of dangerous situations, and that is to make sure your springs are regular services by our professional team. Not only can we adjust their tension and prevent your door from tilting, we will also lubricate their coils and make sure their performance remains as silent and smooth as possible. If during our scheduled appoint we'll find that one or more of these components is in a bad shape, we'll replace it right away. We have more durable options for you to choose form, such as galvanized or oil tempered springs. For the best service around, contact our experts at Garage Door Repair Phoenix today.